How is Rave Reports different from other reporting tools? Rave Reports was created to give you complete control over the printing and reporting process while making it easy to create efficient and maintainable reports. Our philosophy behind every feature we add to Rave is to give you the most functionality in the most efficient code possible. You can see this philosophy in the attention to detail that is put into every Rave feature. You'll benefit from this philosophy as you create reports with Rave and find a system that is flexible and powerful enough to handle anything you throw at it. You'll also benefit from Rave's amazingly small footprint (50K minimum up to 300K for complete code-based and visual functionality) and unsurpassed execution speed. 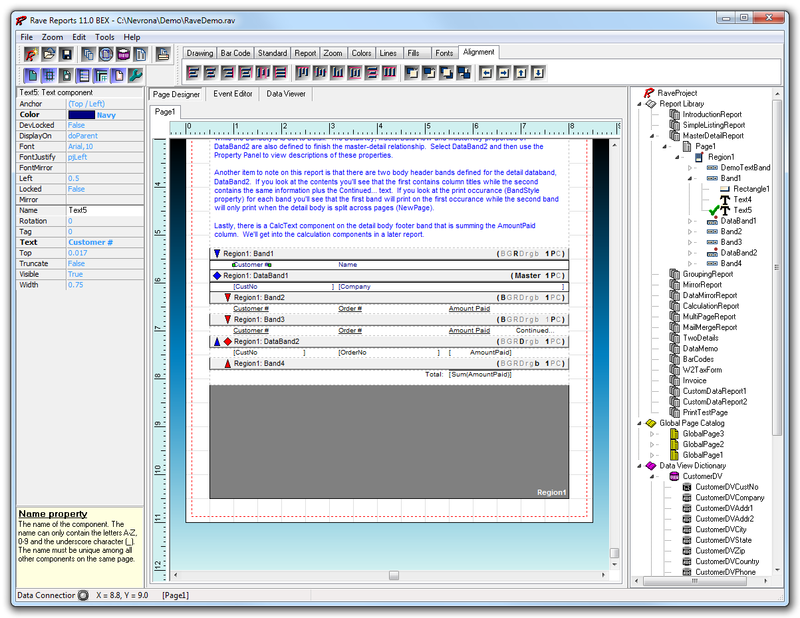 Rave is actually two products in one, a code-based printing engine and a visual reporting interface called RAVE (described in the rest of this document). With Rave's code-based system, 14 Delphi components and over 500 methods, properties and events provide complete control over any aspect of the printing and reporting process. Code-based printing is used by many of our customers to create fast and maintainable reports that would be impossible to do without coding directly to TPrinter or the Windows API, while hiding all of the nasty details that these latter approaches require. The code-based printing library can also be used in an application with simple printing requirements with a small footprint. If you are looking for a visual reporting tool, then read on and we guarantee you won't be disappointed. Our visual report designer, Rave (Report Authoring Visual Environment), is a component-based designer specifically written with reporting in mind. Rave's page-based layout offers a more visual interface when compared to traditional designers that only offer a banded view. 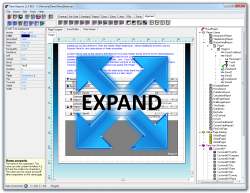 If your end users need to modify or create reports, they will have full design capabilities since Rave is completely self contained and doesn't rely on items such as Delphi's Object Inspector or other Delphi designer tools. Also, Rave allows you to work with a reporting project where you can store and share items between all the reports of your application in a single file. These and many other exciting items will be described in more detail in the following sections.